Chase the Aces Raffle is the new radio contest that offers Okanese First Nation listeners the opportunity to win weekly cash prizes while supporting their favourite local community radio station. Read on to learn details about how and when to purchase tickets, payout amounts and other information. Have questions? Contact our office for answers. Once your e-transfer is received and accepted. Mz. D will fill out the raffle tickets for you, and send you a picture of the completed tickets before she places them in the raffle drum. Each of these pots shall then grow by their respective percentages, based on the prior week’s ticket sales. 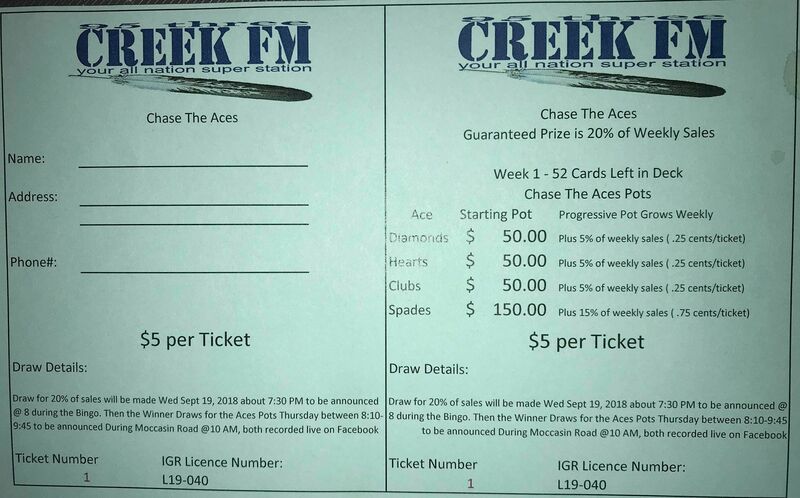 Once the card is drawn that will conclude that week’s draw and new “Chase the Ace” Jackpot balances will be updated and printed on the next weeks raffle tickets sales stubs. Raffle sales will take place between Thursday 12:00 P.M. through to Wednesday 7:30 P.M.
E-Transfer(s)/Ticket requests that come after 7:25 P.M. will be entered into the next weeks draw, If there is no draw the E-Transfer will be refunded. Attendance at the draw is not mandatory, and the First name drawn from the Raffle drum will win both the 20% of the weekly sales prize and the chance to draw an “Ace” from the deck of cards. The raffle drawing will take place on Wednesday at Approximately 7:30- 7:45 P.M. on Facebook Live and announced during our media Creek FM bingo. The drawing for the “Ace” will take place on Thursday between 8:15-9:45 AM and announced during the on-air, Moccasin Road Program. In the event that the raffle winner cannot attend for the “Ace” drawing, a Proxy may draw for them and the prize(s) (Raffle portion & possible “Ace” portion) will be sent to the address provided from the raffle ticket sale, delivered if in the local towns, deposited in their bank account or can be picked up at the winner’s discretion. As the Creek FM is a radio station and does not have the capacity to hold a large number of people all draws will be made in front of witnesses from the station and taped/recorded and posted on the Creek FM’S Facebook page. Marylynn Dumont, Daniel Walker, Cade Tuckanow, Randy Stonechild, and William Yuzicapi are not allowed to purchase tickets as they may be requested to act as proxy for a raffle winner and they will also be serving as witnesses for the event. Those that wish to attend the drawing may do so, but please keep in mind the limited space at the radio station. In the Event that two or more names are put on the ticket, the winnings will be split equally between all named individuals each receiving a check. The deck shall consist of a new standard 52 card playing deck. Once a card is picked it shall be shown to the witness’s and then ripped in half and no longer be part of the eligible deck of cards. The ripped remains shall be placed in an envelope/folder for record keeping purposes and then destroyed once all 4 aces have been won. d) 5% shall go to the Ace of Diamonds, 5% to the Ace of Hearts and 5% to the Ace of Clubs growing jackpots. a) Aces of Diamonds, Clubs and Hearts will be added to the Ace of Spades Pot if it is still in play, if not then evenly among the remaining ace pots. b) Aces of Spades will be distributed equally among remaining aces. The Creek FM dealer shall show to the raffle winner/proxy, witnesses and the recording device that the “Aces” are in the deck. Split the cards in 2 equal stacks and riffle the cards once more. They shall then place the deck on the table and “fan” out all the cards (facedown) “wash” the cards and then allow the raffle winner/proxy make a 1-card selection and pass it to the “dealer” who shall then reveal what the card is. Once the card is revealed to the raffle winner, witness and recording device, the dealer shall reveal the rest of the deck to ensure that the proper number of aces were indeed in play, then stack the cards into a deck and replace them into the box that they came with, tape the box and place it in a safe located onsite in readiness for the next week’s draw. 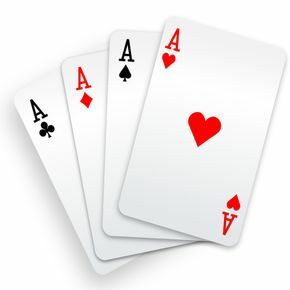 The first dealer shall reveal the remaining aces and insert them back into the deck, shuffle the deck and place the deck on a table, performing at least three “washes”. Once this is performed the second dealer shall then perform 3 additional “washes” and once he/she is satisfied that they are properly mixed shall step back and allow the raffle winner to select their card, which in turn will be revealed to the witnesses, the recording device and those in attendance. In the event that any winner is owed more than $10,000.00, the winner will receive a good faith payment of $5,000.00 and the remainder will be paid following the Indigenous Gaming Regulators verification of a “clean” draw through a review of the videotaped event.